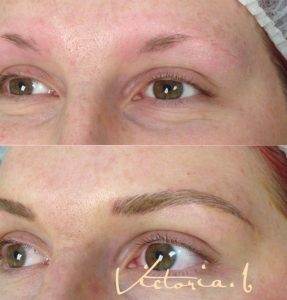 Victoria specialises in cosmetic tattooing for women and for men. She understands the different requirements whether you are young, less young or in between. 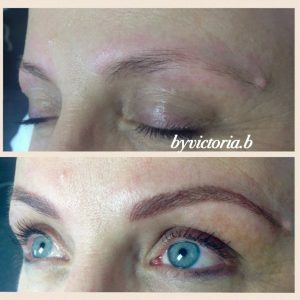 She is passionate about brows and has been performing cosmetic tattoo for 10 years. Victoria stays abreast of trends, and techniques. Currently undertaking a Phi Brow master course. Young Women & Less Young Women. 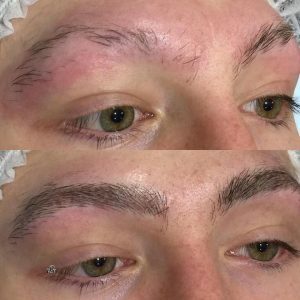 An eyebrow tattoo is about achieving defined, perfectly shaped feathered brows, without having to use powders, gels and pencils. 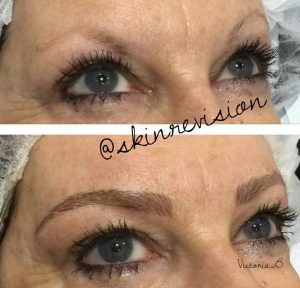 As we get less young our brows can lose definition or become sparse. For these ladies, feather eyebrow tattoos can make us look younger. Now that is a bonus! We feel more confident with a little bit of lip colour and our eyes and brows defined, BUT most of us hate applying makeup every day. 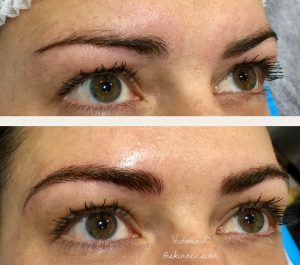 Look fantastic 24/7 with a Cosmetic tattoo for eyebrow feathering, lips and eyeliner. Makeup that stays in place! Cosmetic Tattooing is about enhancing your natural features, saving morning rituals. It is about getting the makeup look you want or feeling more confident to go out without makeup. 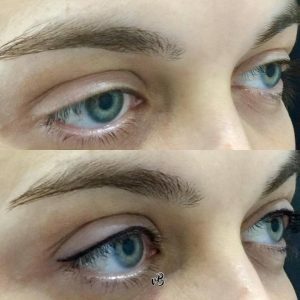 As a bonus – eyebrow tattoo can look more natural than wearing makeup because the pigments are in your skin not sitting on top. Eyebrow feathering, 3D Brows, Powder Brows or Phi Brows? 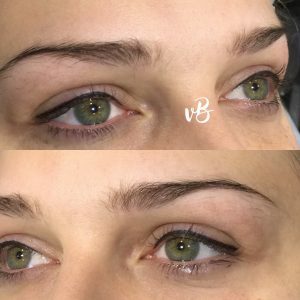 There are trends in eyebrow styles and techniques, but equally important as following the trends is getting and eyebrow style that suits your face shape. Our cosmetic tattoo expert Vicky does not support a one size fit all practice. 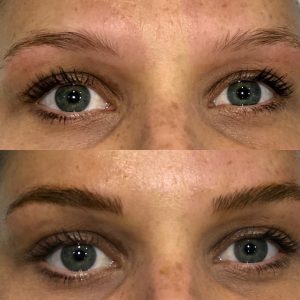 She tailors your brows, choosing the perfect shape by working with your brows, the shape of your face to blend the most natural looking outcome. 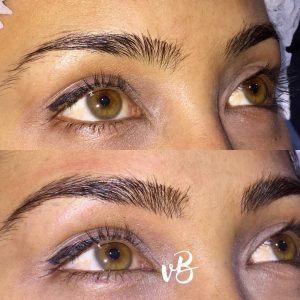 Off course fashion is important and Vicky has experience in eyebrow feathering, creating beautiful individual and fine hair strokes, 3D Brows, Powder Brows & Phi brows, staying up to date with industry trends. 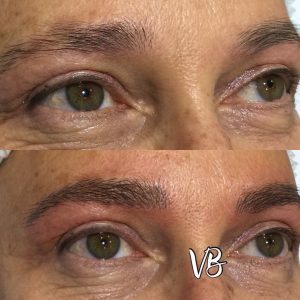 Eyebrow Feathering For Young & Less Young. If you are young or less young the reason for getting an eyebrow tattoo varies. 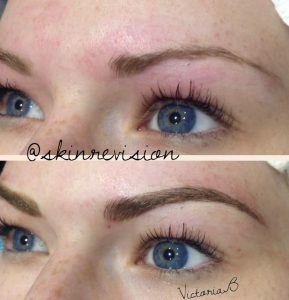 Young women often just want to define, perfectly shaped brows! Eyebrow feathering makes it that simple. 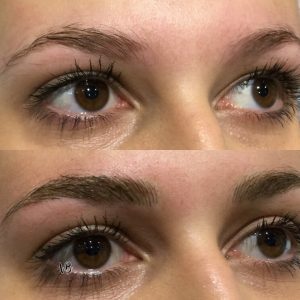 Sometimes with less young women, eyebrow hair has become sparse, either naturally over time, or from old waxing or plucking accidents. Feather eyebrows recreate brows that look stunning and can make you look years younger. 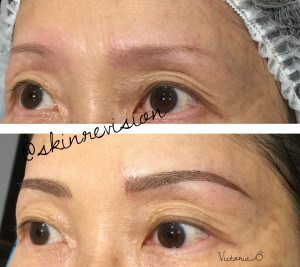 Our Cosmetic Tattooist Vicky offers a free consultation: In this time, she will go through what you want to achieve with your enhancement. Eyeliner tattoo involves the application of pigments to create a more open and appealing look to the eyes. It has been a makeup trick of women for centuries to develop more attractive looking eyes. The variation is cosmetic eyeliner tattooing is enormous, from a subtle natural look; implanting pigmentation in the lash line to create more definition and the appearance of thicker eyelashes, shadowing of colours to enhance the natural eye colour, to a bold thicker application of eyeliner for a more exotic look. Wake up with your eyes looking bright and defined and continue that look all day no matter how active you are without applying eyeliner pencil. 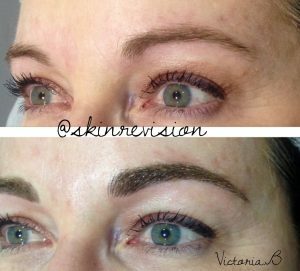 Our cosmetic tattooist Vicky will lend her professional opinion on the style, shape and colour to enhance your natural eye features the choice is ultimately yours. Cosmetic lip tattoo (lipstick tattoo or lip liner tattoo) so your lips look great 24 hours a day. It stops the hassle of having to reapply lip liner and lipstick, smudges on glasses and cups and lipstick bleeding. Imagine applying a little lip gloss for your lips to have a perfect shape, colour and pop. Cosmetic lip liner and lipstick tattoo are the application of pigments to create a more desirable lip shape. No matter your age, the reason is the same, though there are subtle differences between young and our less young ladies. 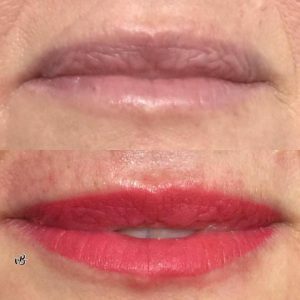 For young women, a lip tattoo is about wanting to create a bigger or fuller look, without going down lip filler route and for our less young ladies, recreating the look of volume that has been lost naturally over time. For both it about having lips that look great 24/7 without applying lipliner and lipstick. *One of the biggest reasons young women elect to get permanent lip colour is they want their lips to look plumper & bigger without having lip fillers. They may be scared they will end up with a fake look from lip fillers, or they have seen a bad result. Lipstick tattoo involves tattooing a defined lip line and then infilling the colour. The colours tend to be natural looking, and Vicky will match to your skin tone and eye colour. *A second reason is to achieve increased lip line definition, as their lips do not have defined colour border. 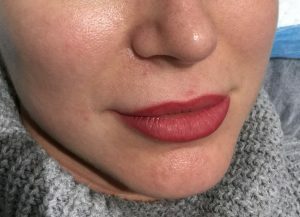 Creating a lip line with subtle colour fill will make your lips appear fuller without the addition of dermal fillers. *You may just be tired of applying lip liner, lipstick, lip gloss to have your lips pop. *Are tired of applying lipstick. *Have lost volume naturally over time, lips have become less defined or smaller. *Ladies who want to create a perfect shape in lips with asymmetry. Lipstick tattoo and lip liner tattoo: achieve the lips you want. 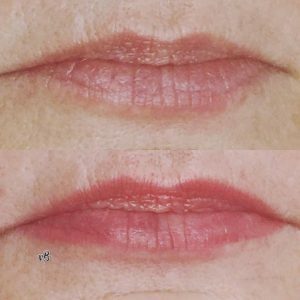 Our cosmetic tattooist Victoria will lend her professional opinion on the style, shape and colour to enhance your natural lip features the choice is ultimately yours. 1. 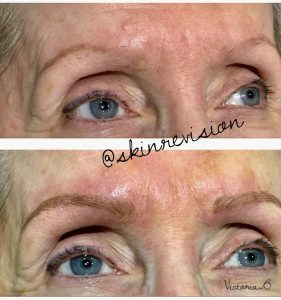 You want perfectly shaped brows that stay put! 2. You have fair complexion: Eyebrow, Eyeliner and lip tattooing all enhance your natural features. 3. You want a natural ‘no’ makeup look. 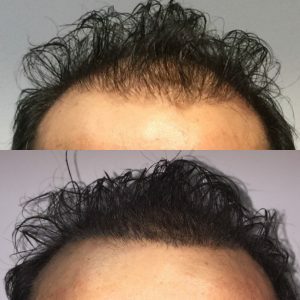 Modern cosmetic tattooing is a very natural enhancement of your features. 4. 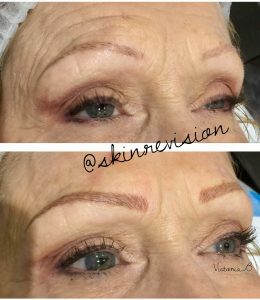 Old waxing or plucking accidents, or injury that has created gaps in the brows and interfered with your best brow line. 5. Difficulty applying makeup. As you get less young makeup application can become difficult! 8. To look younger! 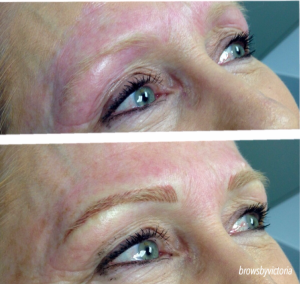 Cosmetic tattooing redefines a more youthful look to eyebrows and lip line. 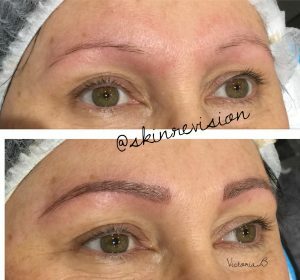 A Cosmetic tattoo is a semi-permanent enhancement of natural features rather than an artistic statement, the placement of pigment, the machine and type of pigment used are entirely different. 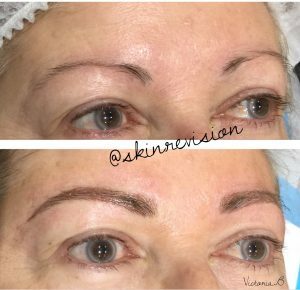 Cosmetic tattooing involves using natural colours, placed more superficially to create a softer less permanent enhancement. Cosmetic tattooing is commonly referred to as permanent makeup. However, the pigments fade over time and reapplication is required to maintain the permanent makeup look. You will find the cosmetic tattoo lasts 2-5 years. By this period most ladies seek to get it redone. 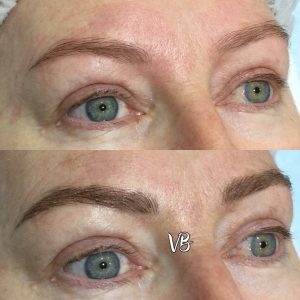 With eyebrow feathering the results do not last as long, and many women choose to get a refreshed brow at between 1 & 2 years. 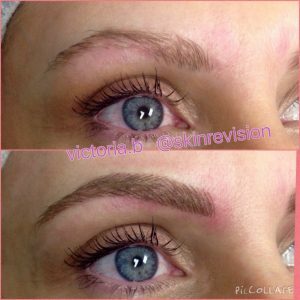 Vicky will lend her professional opinion on the style, shape and colour to enhance your natural features but the choice is ultimately yours.